Capturing special moments everyday can be important when the little ones are growing so quickly. Cluster canvases are the perfect way to display all those precious memories by easily printing your digital pictures to canvas. We have pre-selected sizes that come together in a harmonious way to hang your precious images for everyone to enjoy. Create canvas clusters to personalize and fill the empty space on the wall that you’ve been wanting to decorate. Highlighting your favorite memories with various canvas prints is done effortlessly in a cluster canvas group, turning your photographs into a complete storyboard. The Limelight is a fun approach to take three of your most beloved pictures and showcase those cherished smiles on professionally wrapped canvas prints. Head outdoors with the kids for an annual picture walk. Give them a camera and let them snap away while you capture the candid moments behind the scenes. It’s a fun way help them learn about their world while they experience the joy of seeing the prints they created once the images are printed. Catching a cute pose with those adorable cheek to cheek smiles is perfect for the large canvas. Then print two of your favorite candid shots on the smaller canvas for that tender touch! Hang their printed works of art on the fridge and print your favorite “behind the scenes” moments on canvas. It is an excellent way to give your home that personalized charming feel you are looking for. Have A Photo Shoot On The Calendar? A family photo shoot can be a fun experience that stays with you and your family for many years to come. Why not bring those moments back to life by printing your digital photos on canvas! The LimeLight is a great cluster set for any family of three or four. It is a favorite among young, growing families as it is easily expanded to fit any wall space. Print the whole family on the larger canvas and then use the two smaller canvases to print pictures of the kids. Individually, with mom and dad or just the kids in a couple fun poses, the smiles you get to enjoy will be priceless. It’s an excellent gift for parents or grandparents and the perfect addition to your growing collection of memories. With little ones in the house, capturing every precious moment is as enjoyable as it is entertaining. Each one of those moments has captivated you so we have made it our mission to help you preserve those memories for as long as possible. The moment you first laid eyes on your baby, his first smile, her first steps...all cherished instances that should never be forgotten, yet can easily be printed on a gorgeous set of wrapped canvas. The LimeLight can easily be the start of these new milestones you and your family are creating or the connecting arrangement to bring your family photos full circle. 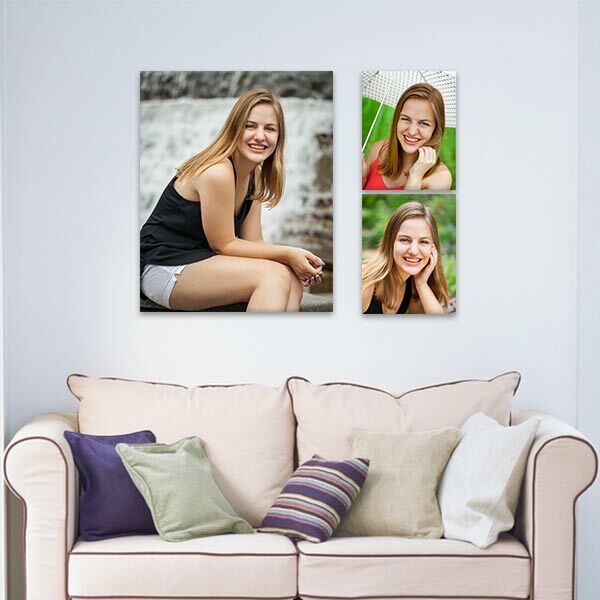 Use the larger canvas for a gorgeous high school graduation portrait and the two smaller ones for that adorable picture of your son or daughter's first day of Kindergarten and the memorable first day of high school. Just like the Limelight, our Contemporary cluster is perfect for your kids' best school photos or your other treasured family moments. Every occasion can be turned into a unique and special moment. When capturing memories, creating an arrangement with those photographs is the best way to keep those moments untouched. Wedding pictures are some of our favorite memories to print on canvas. With the LimeLight, you can easily display a beautiful picture of the bride and groom on the 24x30 and use the two 11x14 canvases to print a couple timeless black and whites or even a candid moment or two. Engagement photos can capture the most beautiful moments of love and affection. Why not get those printed on a cluster set to hang at the wedding reception! At the end of the day, you get to hang them on your wall to see the glowing smiles over and over again. If the wedding has already passed and you are celebrating a milestone anniversary, this is a beautiful cluster arrangement to showcase the many years of love you are celebrating. Perfect as a gift or just to showcase that anniversary picture you love along with a photo of the kids and your favorite wedding picture as bride and groom. Whether you are giving The LimeLight as a gift or creating the canvases for your own home, it is the perfect canvas grouping for engagement, wedding or anniversary photos. Got a family reunion on the way? Are you celebrating your parents anticipated and much deserved retirement soon? Cluster canvas sets can offer a stunning presentation of your fondest memories. Hang The LimeLight in your home with the moments you have enjoyed together as a family. Take a few pictures of the growing family at the next family reunion and get them printed on a stunning wrapped canvas print. Celebrating special birthdays are also fun pictures to print on canvas. Your son or daughter’s 1st birthday picture along with 2 other milestone birthday moments are fun memories that are as unforgettable as they are special. Adding them to canvas is an excellent way to enjoy them day after day. It is the perfect way to add smiles to any wall and bring memories back to life. The holidays are the perfect time of year to gather the smiles and turn on the cameras. With everyone already looking their best, it will be very easy to snap a few pictures of the kids with grandma and grandpa. You might even want to get a group picture of everyone that you can print on the large canvas and a picture of all the kids and grandkids for the smaller canvases. Whether your photos are classic smiles or goofy faces, choosing just three will not be an easy task. Luckily expanding with The LimeLight is as easy as creating another set of 11x14 wrapped canvases. Photo wraps around the edge of the canvas print, optionally choose a neutral colored edge to prevent cropping of your photo. Canvas arrives ready to hang with a professionally sealed back. The LimeLight permits you to take three of your most loved photographs and hang them to be presented in an intriguing yet elegant way, any place that space permits in your home. Show off those contagious smiling faces with a gorgeous display of your family photographs. Everyone who enters your home will enjoy and admire the beautiful photos you adore. This cluster grouping includes one 24x30 Wrapped Canvas and two 11x14 Wrapped Canvases with a coverage area of approximately 37x30. Your pictures deserve to be printed on canvas and given a special fine-art treatment. Weddings, birthdays, graduations, landscapes and photographs of all kinds are accentuated by the texture, and elegant arrangement of your digitally printed canvases. Each canvas will arrive ready to hang with a professionally sealed back. Square Canvas, Panoramic Canvas prints and Small Photo Canvas print options are also available to print any digital photo to canvas. The arranging options are endless with the many different styles and sizes available. Perhaps you’d like to display your photos with our more modern Aluminum Panels. Get your favorite pictures printed directly on a smooth piece of aluminum. The shiny, reflective surface adds unique shimmery flare to your photos.